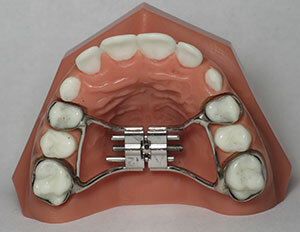 The expander is designed to widen the palate and/or correct your child’s crossbite. Here are a few helpful tips for home. Your child will need a few days to get used to the feel of their expander, as it may feel tight and uncomfortable at first. Chewing, swallowing, and talking may be awkward initially, but will become easier and more normal as your child adjusts. Soft, easy to swallow foods are recommended initially (ex: macaroni and cheese, pancakes, scrambled eggs, puddings). When introducing chewy and crunchy foods (steak, chips, raw veggies), cut into smaller pieces and take smaller bites to make eating easier. 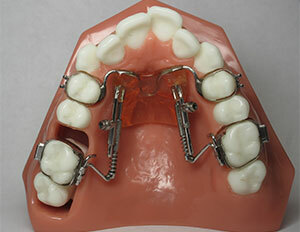 It is important to keep the expander and underneath the expander clean. Brush 3 times per day, and make sure to brush all parts of the appliance and the roof of their mouth. Use the syringe during brushing and after meals to help remove buildup. The expander will need to be turned once per day for approximately 3 weeks. During the turning process, their mouth, nose, and teeth will feel some pressure that may last 10 minutes. Around week 2, a space may open between the front teeth. This is a normal part of the expanding process and is a sign the appliance is working properly. At this time, the upper front teeth are sometimes sore. This is also normal. A follow-up appointment will be scheduled about 3 weeks from delivery, and Dr. Webb will determine if the expansion is complete or if more turning is necessary. Once the turning is complete, the appliance will be left in for an additional 4-6 months to hold the expansion. The expander is cemented onto your child’s teeth with special cement. Sticky foods, chewing gum, and sticky candy should be avoided to prevent the appliance from loosening. However, if this should happen, please call our office so we may recement it. If you have any questions or concerns, please call. We are always happy to help! The tongue crib is an appliance used to help control habits such as a tongue thrust or thumb sucking. The crib, or “wire cage” is placed behind the top front teeth and is either attached to an Expander or individual bands on the first molars. The crib will prevent the habit from continuing, and/or try to train your tongue to stay in the desired location. As the appliance works, it is common for the crib to get pushed up against the roof of your mouth. If this occurs, or if any part of your appliance feels loose or broken, please call the office so it can be repaired or adjusted. A lingual arch, also known as a space maintainer, is designed to keep teeth in their current position to allow future teeth to erupt into an improved position. Bands are placed on the lower first molars and a U-shaped wire is attached to prevent the molars from migrating forward. The lingual arch will remain in place until permanent teeth begin to erupt. Initially, some soreness may occur. Advil, Tylenol, and other pain relievers may be used to ease discomfort. Placing wax on any rough spots of the appliance will protect your cheeks and aid in the healing process. While the lingual arch is in your mouth, it is important to take care of it properly. Continue to brush and floss your teeth regularly, as well as brushing around the wire of the appliance to remove any debris. Avoid sticky foods such as gum, hard candy, and caramels to prevent breakage. 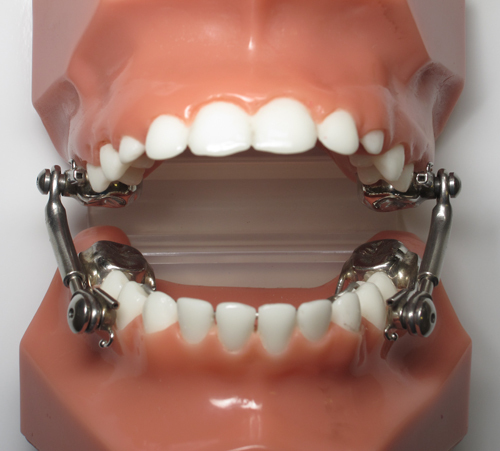 If your lingual arch ever feels loose or broken, please contact the office so we may repair it or fabricate a new one. 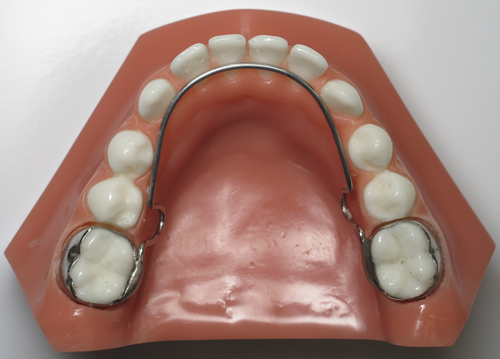 Today we gave you an orthodontic appliance called headgear. The headgear creates a pulling action to guide the growth of your face and jaws in the best possible direction. It is also used to help move your teeth into a better position. To avoid accidents while wearing your headgear, please remember these rules at all times. ONLY WEAR AT QUIET TIMES! NEVER wear headgear in the car. NEVER ALLOW ANYONE TO GRAB YOUR HEADGEAR. Accidents can happen even when you are having fun with friends who mean no harm. Always attach the facebow to the teeth and hold it with your hand before you connect the neckstrap or the headstrap. Keep the facebow away from your eyes. For best results, you should wear your headgear 12 to 14 hours each day. It does not have to be consecutive hours. Of course, THE MORE YOU WEAR IT, THE FASTER YOUR TEETH WILL MOVE. The major portion of the 12 to 14 hour requirement will be while you are sleeping. The remainder can be accomplished while you are doing homework, watching television, playing video games, or using the computer. Forgetting to wear your headgear will most likely extend the time required to straighten your teeth. Your teeth may feel tender the first week you wear your headgear. Do not be discouraged! The discomfort indicates that ideal pressure is being applied and the headgear is working! As you adjust to the new pressure, the tenderness will disappear. Be sure to inform us if you continue to be uncomfortable. PLEASE ALWAYS BRING YOUR HEADGEAR TO YOUR APPOINTMENTS SO WE CAN CHECK AND ADJUST IT IF NECESSARY. Your headgear is an important part of your treatment. Following these instructions will make wearing your headgear an easy task. 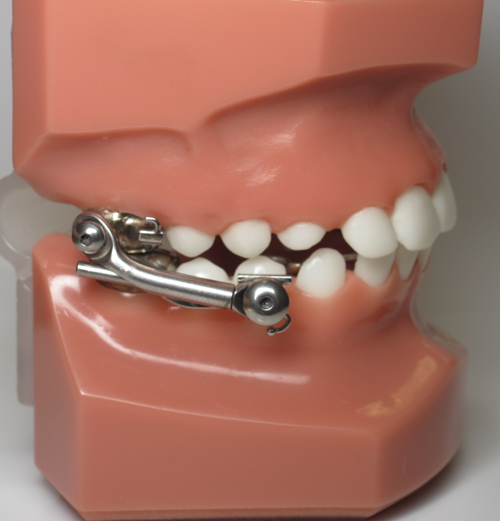 The Forsus is a spring appliance that continuously applies a light force to your teeth to move them into the desired occlusion. It is used in place of elastics, is non-removable, and does not require any adjustments by the patient. It is designed to withstand normal intraoral forces, but it can be damaged or broken especially if appropriate care is not taken. If irritation occurs, wax and Orabase can be used to aid discomfort. Try not to open your mouth extremely wide, as this may cause it to deform, separate, or loosen a molar band. If the Forsus ever interferes with your teeth, do not bite on it. It can break the appliance or cause injury to the inside of your mouth. 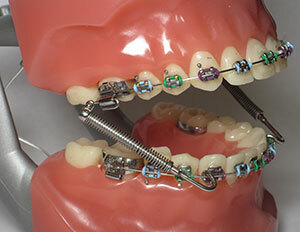 Please continue using the same cleaning and eating guidelines as caring for your braces while the Forsus is in. If anything seems loose or broken, please call the office as soon as possible to schedule an appointment to have it repaired. The Mambo Jet is a non-removable appliance that uses compressed springs to slowly move the upper molars back. It is used to obtain a better bite, reduce over-jet, and reduce crowding. Initially, your teeth may be tender after receiving your Mambo. This is normal and should disappear within a week. Advil or Motrin can be taken to ease this discomfort. Orabase and Peroxyl rinse will be given to you at your appointment to help heal any sores that may develop. Warm salt water rinses can also be used. Wax can be applied to any parts that may be rubbing on your cheeks, making them smoother and helping the healing process. It is important to keep your appliance clean, so be sure to brush your Mambo when you brush your teeth. You will be provided with an irrigating syringe to help you clean above the appliance to prevent food and plaque build-up, as well as bad breath. To prevent breakage, you must avoid sticky, chewy foods, as well as biting into anything hard such as pens, pencils, and ice. These items can bend, break, or loosen the appliance. If any part of your appliance feels loose or broken, please call the office to schedule a repair. 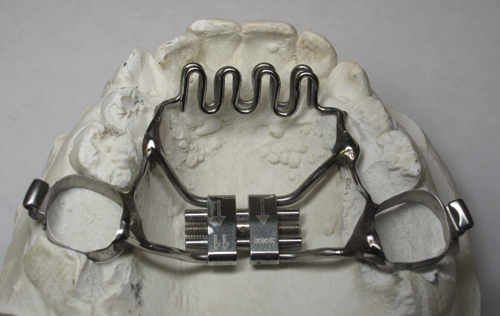 The Herbst appliance is designed to reduce over-jet and attain a better bite by encouraging the lower jaw forward and the upper molars backward. This fixed appliance is used mostly in younger children and is worn for about 9-12 months. smoother and aid with the adjustment process. Orabase and Peroxyl rinse will be given to you at your appointment to help heal any sores that may develop. this problem occurs regularly, please call the office so your appliance can be adjusted. As your bite changes, the Herbst will occasionally need to be adjusted as well. Small spaces may also become visible between the lower teeth which will be corrected with braces. It is important for you to take care of your Herbst while you are in treatment. Do not play with or try to remove your appliance in any way. Doing so may compromise the appliance and cause breakage or delays in treatment. Sticky foods such as gum and caramels should be avoided to prevent damage to your Herbst. Hard foods like raw vegetables and hard candies can bend and loosen the appliance also, so it is highly recommended to avoid these foods during your treatment. If any parts of your Herbst come loose, please save all parts and call the office so we can schedule a visit to repair it.